A brilliant human has launched a Tumblr called "Occupy Herbstreit," which features photos of an anonymous photobomber among the protesters in lower Manhattan, holding College GameDay-inspired signs overhead. Here's a sampling. "Meineke Care Care Bowl is not a living wage." "If the mainstream media won't cover us, maybe the Big 12 Network will." "Our economy is crashing at SEC speed." "Mike Stoops and Locksley will be joining us soon." "No Jobs + No Showers: Occupy Wall Street or Alabama Tailgate?" "Notre Dame thought Charlie Weis was Too Big To Fail." 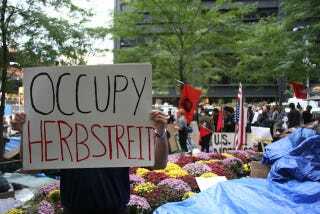 Visit Occupy Herbstreit for the full sampling.